You must begin with a topic question. If your instructor has assigned an essay question to answer, this step has been done for you. If you are doing a research paper, take time to come up with a good topic question. You must form an opinion and state it clearly. Do not be wishy-washy. Be sure you have approached your evidence fairly, without bias. Consider both sides of a controversial issue. Once you've established the topic question, a clear position, and objectivity, you're ready to write a thesis statement. Presents your opinions or thoughts on a subject or an issue. You cannot write an essay without one. Must contain a subject + an opinion. Answers the topic question (the one you created or the one presented to you by the instructor). TIP: A thesis statement should never contain the following: in my opinion, I think, I believe, etc. Tell them that the entire thesis represents what they believe. 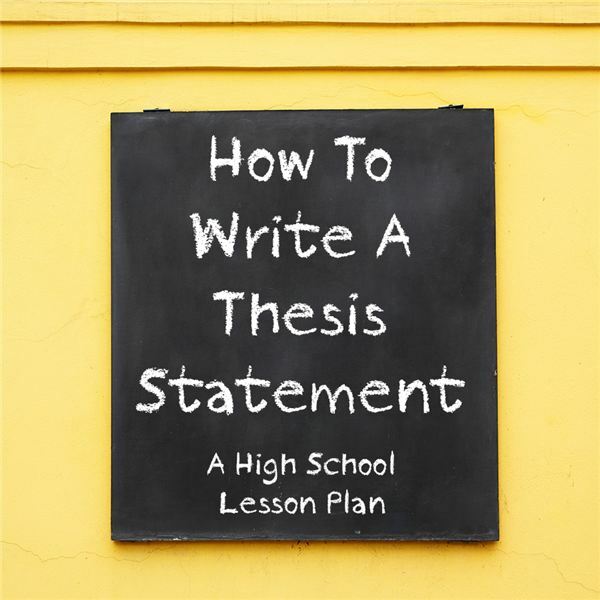 However, it may be helpful for students to begin their thesis statement rough draft with in my opinion, I believe, or I think to make sure they are expressing their thoughts or opinion on a specific subject or issue. When writing the final draft, simply eliminate those phrases. A good thesis statement is short and simple: it should be no longer than one sentence, regardless of essay length. Good Example: Success is a result of doing the right things consistently. Bad Example: In a world full of success gurus and books about success, it becomes ever so more important to delineate the one trait that ultimately determines success: doing the right things consistently. A good thesis statement is limited to one main idea. Good example: The key to successful dieting is focusing on a specific goal. Bad example: The key to successful dieting is focusing on a specific goal, which is also the key to successfully running a business and coaching a football team. Good example: Lebron James' ability to score, pass, and rebound make him the league's most valuable player. Bad example: Does Lebron James' ability to score, pass, and rebound make him the league's most valuable player? Bad Example: Lebron James' ability to score, pass, and rebound just might make him the league's most valuable player. Write several trial statements: writing is a process. Teach your students to revise their work. If you're having trouble deciding which side to take on a controversial issue, write your thesis statement from two different points of view. Then decide which one better represents your opinion. If you still can't decide, list facts on both sides of the issue and decide which facts make a more persuasive argument. Have you answered the question or merely restated it? The following examples are based on this question: Does Romeo's prior feelings for Rosaline diminish the credibility of his love for Juliet? Good example: Romeo's prior feelings for Rosaline diminish the credibility of his love for Juliet. Bad example: This essay examines whether or not Romeo's prior feelings for Rosaline diminish his love for Juliet. Have you tried to argue both sides of the case? It is important to acknowledge the other side and address the other position. That does not, however, excuse you from choosing a side. Good example: Juliet was not the first woman to capture Romeo's fancy; she was, however, the one who affected him the most. Bad example: Romeo loved Juliet with all his heart, but he loved Rosaline too. It could be argued they were both his favorite. Have you prejudged the issue by using loaded language? Immature writers manipulate readers through emotionally-charged language. Bad example: Immature, whiny, male-pig Romeo, a male harlot, ruined precious Juliet whom he loved no more than Rosaline. The following activities will help reinforce the concept. Read the thesis statements anonymously. The ones that do not qualify get tossed in the garbage can (visualizing what happens to writing is powerful). Give students a chance to rewrite until they get it right. Write random topics on the board and have groups of students brainstorm good ones. Make the thesis statements part of a writing challenge. Require that students get thesis statements approved before writing an essay. Click here for a complete 1st semester curriculum map for language arts with lesson plans and links. Fun Lesson Plans for Reading and Language Arts: Use White Boards to Ignite Student Participation.